The word "voile" comes from the French word for veil, which is an indication of the fabric’s intrinsic nature: light-weight and semi-sheer. Voile's plain weave construction makes it similar to other light-weight woven materials, such as muslin, organdy and organza. Crisp, yet comfortable against the skin, voile has been used in women's undergarments and summer clothing. But it is not only for apparel; voile is often used in home furnishing applications such as curtains and window treatments. Voile fabric is manufactured by using the plain weave, which is similar to the basic basket weave construction. 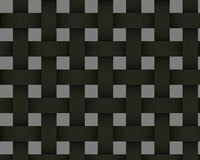 The plain weave is a grid-like format, with horizontal yarns (also known as weft yarns) floating over and under vertical (or warp) yarns. Voile fabric is woven using the shuttle method, where weft yarns are shuttered back and forth, in and out of the warp yarns. This method can make the voile fabric loosely or densely woven, depending on the thread count used. The plain weaving technique allows voile fabric to remain semi-sheer, even if there is a high thread count. Originally voile was made with natural fibers, such as cotton, linen and wool—which are fibers that have a long filament, or naturally come in long strands. The fibers are combed and then tightly twisted to give them the stiffness and slight sheen associated with the fabric. Contemporary manufacturers of voile have expanded the fiber repertoire to include other long filament fiber, such as worsted silk (which is unwrapped from around the silk worm in one long strand) and synthetic fabric (which can be manufactured at any length). No matter the fiber content, whether 100-percent natural, blended or completely synthetic, twisting the fiber is what gives voile the sheer, clean-cut appearance that can rival organdy. The light-weight and semi-sheer nature of voile is what makes it perfect for curtains, mosquito nets, and in some cases, sundresses. With its dense weave of highly twisted fibers, voile still maintains a crispness that can sometimes feel wiry to the touch. Because it doesn’t have the elegance of organza, voile is more suitable for casual summer or resort wear, rather than evening clothing. Though it is a more refined fabric than the similarly woven muslin, voile does have a similar draping ability. It is stiff, but not so inflexible that it can’t be gathered tightly together. In fact, its soft yet firm hand is what made it perfect for petticoats in the early 1900s. Unlike muslin, voile has a smooth matte finish that is achieved by singeing away any loose fibers on the fabric’s surface. The fabric is available in the plain pattern, but fancier more expensive versions, such as seeded, striped, corded and piqué, have been manufactured in France and England. Traditionally a natural fabric, in the past voile had been dyed with a variety of vegetable and protein dyes—which limited the fabric’s available color palette. Since the fiber content of today’s voile has changed, there are more options when it comes to synthetic dyeing and finishing options. What Is Muslin Fabric Used for?